During the war with Georgia in 2008, the Russian forces had only a few UAV systems in service; all of them were cumbersome, primitive, and obsolete. During the post-war analysis, their performance was deemed totally inadequate because they failed to meet modern technical requirements. As part of the sweeping military reforms launched shortly after the conflict, the existing drones were retired, and the MoD placed orders for hundreds of new ones. As of late 2015 (i.e. when Russia was already involved in Syria), its Armed Forces operated a total of 1,720 UAVs. In 2016, they received an additional 105 UAV complexes with 260 individual drones. 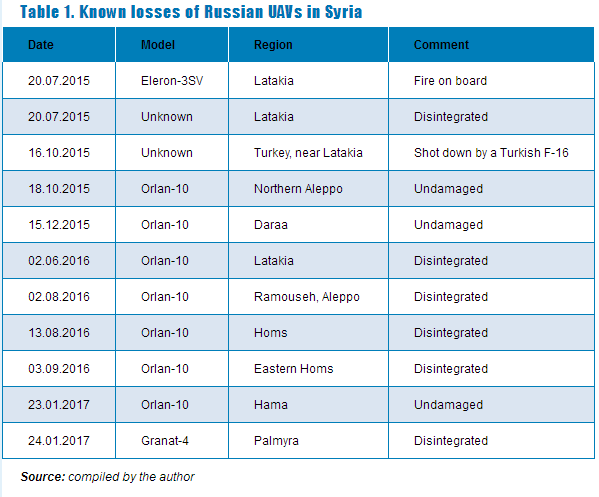 As of the spring of 2016, Russia had 30 UAV complexes (70 individual drones) deployed in Syria. In December 2016 it was reported that another three complexes (consisting of six to nine drones) had been brought to Syria to monitor compliance with the ceasefire agreed between the government and the rebels. The Russian UAV fleet deployed in Syria included systems operated by the UAV companies of brigade and division-level Army units. Additionally, Russia deployed several Orlan-10 and Forpost drones (the latter being the Russian version of the Searcher Mk II drone developed by Israel’s IAI) that are operated by Navy units established in 2013. The involvement of the Navy is easily explained by the fact that it operated six or the 10 Forpost complexes (three drones per complex) that the Russian forces had at the time, and the Forpost is the only Russian drone that approaches the capability of the MALE (medium altitude, long endurance) class of UAVs. All the remaining Russian drones (almost 2,000 of them, as of the time of writing) have a take-off weight of no more than 30kg, and are vastly inferior to the Forpost in terms of the payload. The joint command of the Russian forces in Syria has managed to ensure proper coordination between the use of drones operated by the Army and the Navy. For example, the naval drones were used to support operations by the Russian Air Force and the Russian and allied land forces in Syria (in addition to the Navy’s own operations). Interestingly, there have been few, if any reports from Syria about the use of Russia’s lightest short-range tactical UAVs, which are used by troops at or near the front line. This does not mean that the Russian forces completely lack such drones – it rather confirms that the use of the Russian land forces in Syria remains limited. Apart from the Forpost, the Russian UAV model that has seen the most action in Syria is the Orlan-10. Such a conclusion is based on the available photo imagery and video footage from Syria; videos from UAV cameras released by the Russian MoD; and from reports on the Russian losses in Syria. The widespread use of the Orlan-10 is unsurprising because it makes up about a third of the entire Russian UAV fleet. In fact, the Orlan-10 specifications largely determine the reconnaissance capability of the Russian forces in Syria. These specifications aren’t too bad, given the system’s take-off weight of just 18kg. The drone can carry up to 5kg of payload such as stabilized day- and night-vision cameras and electronic warfare devices. Even a small drone can transmit live video from up to 120km away, and stay aloft for 14 hours at an altitude of up to 5,000 meters. The effective range of video transmission can be increased further by using another Orlan-10 as an airborne relay station. The drone can also record footage up to 600km from the ground control station in the offline mode. The drone’s propulsion unit is an internal combustion engine that takes regular gas. It takes off using a simple collapsible catapult, and lands with the help of a parachute, so it does not need a landing strip and can be operated from pretty much anywhere. When dismantled and packed up for transportation, the entire drone, along with its team of operators, can all fit into a single car. As a result, the Orlan-10 is affordable and cheap to operate. A set that includes two drones, the ground control station, the payload, the various accessories, and the light vehicle that carries it all costs the Russian MoD 35m roubles (600,000 dollars), so it has been procured and supplied to the Russian forces in large numbers, and relatively quickly. The availability of numerous drones with a range of over 100km has enabled the Russian forces in Syria to deploy them in every part of the country where the government is fighting the ISIS forces and other rebels. There have often been several Russian drones aloft at the same time. For example, during the first Russian missile strike using Kalibr cruise missiles launched from RNS Rostov-on-Don (a Project 06363 large diesel-electric submarine) on December 8, 2015, UAVs simultaneously observed the launch of four missiles from a submerged position, part of their flight to targets, and all three of the targets. That required the simultaneous use of at least four or five drones. The primary roles in which Russian drones are used in Syria include reconnoitering targets for airstrikes, assessing the results of those strikes, and serving as airborne spotters for the Syrian artillery. In fact, artillery spotting is one of the main roles in which drones are used across the Russian armed forces. There are numerous videos of barrel and rocket artillery strikes in Syria recorded from UAVs. The Soviet Army had practically no proper means of real-time aerial artillery spotting. Russia had no such means at all, until modern UAVs arrived. At this stage, however, the Russian forces have aerial spotting capability for all types of artillery, including the Smerch long-range MLR systems, and for sub-strategic missiles. The Orlan-10 and Forpost software is well-suited for that role, and both drones can be integrated with automated artillery fire control systems. Lighter UAVs are less capable, and can be used mostly for mortar spotting. The Russian Army still remains heavily reliant on artillery, so the use of drones can substantially augment its firepower. We do not know whether UAVs have been used for target designation with guided artillery projectiles, but Russian programs to develop that capability have already reached the trial phase. The vast majority of the missions involving the heavier Forpost drones, which are equipped with powerful optics, were to observe and monitor strikes against top-priority targets from medium altitudes and distances, thereby remaining undetected by the enemy. The same usage scenario is not always possible with the lighter drones, which have to approach the target more closely for effective surveillance. Other missions included collecting aerial imagery and 3D-mapping in support of humanitarian convoys and S&R operations. For example, when the wreckage of the Russian Su-24M2 bomber shot down by a Turkish fighter jet fell to earth in a mountainous area near the Turkish border, the surviving member of the crew was quickly located with the help of an Orlan-10 drone, making it possible to extract him from rebel-held territory. The crew that piloted the drone later received medals for their crucial role in the S&R operation. The Russian UAVs deployed in Syria were initially stationed at the Khmeimim airbase in Latakia Province. As the scope of the Russian involvement grew, some of them were moved to other bases across the country. The combined units that operate the Forposts require a runway, so they are usually stationed at airfields. During the offensive to retake eastern Aleppo from the rebels in August 2016, one of those units was deployed at Aleppo international airport. Another Russian unit operating UAVs was stationed at the T-4 airbase near Palmyra; its drones were used against ISIS. The deployment of drones near the front line has enabled the Russian forces to launch missions more quickly and to increase the drones’ airborne time in the target area. On the whole, the use of Russian reconnaissance drones in Syria has been judged a success. Nevertheless, the campaign has highlighted one critical flaw: the Russian forces don’t have any attack drones – unlike not only the U.S.-led coalition, but also the Israelis, the Iranians, and the Turks, who all have medium-class attack drones in the Syrian theater. Even the ISIS terrorists have cobbled together ultralight attack drones, used as bombers, from off-the-shelf components. Russian engineers are currently experimenting with the use of remotely controlled containers attached to the Orlan-10 drones; if necessary, these can be used for weapons delivery. But the maximum payload of the Orlan-10 is only 5kg, so these drones are ill-suited for such roles. We don’t have any reliable information as to whether these experimental prototypes have been used by the Russian forces in Syria. The Russian MoD commissioned the development of medium and heavy UAVs back in 2011, but these programs are still far from fruition. Work is under way to develop drones with a take-off weight of 1-2 metric tonnes and 5 tonnes. Their prototypes have already begun flight testing, but without any weapons payloads. The Russian defense industry is also developing a 20-tonne UAV, but that program is making even slower progress and has not even reached the flight testing phase. It can be hoped that the experience gained in Syria with reconnaissance drones will help the Russian forces to make better use of attack UAVs once they have entered production. These UAVs will be integrated with the already existing extensive infrastructure for this type of weaponry, enabling Russia to narrow the gap in UAV technology with the world’s leading military powers. Like all the other users of military drones, the Russian government was happy do discover that the loss of these drones on the battlefield doesn’t make headlines or cause any problems with public opinion. The Russian forces are known to have lost at least 10 UAVs during the campaign in Syria – but that has gone almost unnoticed in Russia itself. Besides, the drones are easily replaced; they are only a part of the larger complex that enables their operation. The first Russian drone was lost in Syria on July 20, 2015, two months before the official launch of the Russian campaign there. It was an Eleron-3SV, operated by the Army; the drone was shot down in a mountainous area in Latakia. The Eleron-3SV is a light tactical UAV. Used by units deployed on the front line, it has a maximum range of 15km. It is not clear whether the drone shot down in Latakia was operated by a Russian crew; it may have been supplied to the Syrian forces. So far, however, there have been no reports about any Russian drones being supplied to Syrian government troops or their allies. At about the same time, the Russian forces lost another drone in Syria. Its specific model is unknown, but judging from the payload it was carrying, the drone was being used for 3D mapping of the area, perhaps in preparation for future airstrikes. A similar Russian drone was shot down by the Turkish Air Force as it strayed into Turkish airspace from Latakia Province on October 16, 2015, which is after the official launch of the Russian campaign. Even though the UAV had the same livery and side marks as other Russian military drones, we have been unable to identify its model; it may have been a specialized model or an experimental prototype. Another piece of evidence pointing to the use of experimental UAVs in Syria is several reports suggesting that one of the Russian drones deployed in that country uses hydrogen fuel. The unit is merely a prototype and is not yet ready for entry into service. Nevertheless, it is unlikely that it would have been field-tested in Syria if the MoD had not shown interest. Also, in October 2016 rebel forces found a Russian Ptero drone in Latakia province. The unit seemed to have emergency-landed itself and did not appear damaged. The Ptero is not officially in service with the Russian armed forces; it is a commercially-available drone used for aerial imaging. All the other Russian drones lost in Syria are well-known reconnaissance models widely used by the Russian forces. In most cases, the lost units showed no signs of combat damage, i.e. holes torn by bullets or shrapnel. Some of them were damaged by impact with the ground, while others appeared completely undamaged. This suggests that many of the lost drones had suffered a mechanical failure (usually problems with the engine or avionics). Most of the Orlan-10 units lost in Syria had obvious signs of wear and field repairs, pointing to their heavy use. It is known that some of them were many times over their nominal lifespan of 100 flights. UAVs remain a relatively new and untried technology for the Russian armed forces. Their deliveries in large numbers began as recently as 2013-2014. The Russian campaign in Syria, which has been ongoing for more than 18 months, has demonstrated that this military technology is critically important. Russian Defense Minister Sergey Shoygu has described UAVs as “indispensable in modern conflicts”. The experience earned in Syria may facilitate the development of the second generation of Russian reconnaissance drones and spur the arrival of attack drones, from light tactical models to heavy units weighing up to 20 tonnes. The supplier of the Forpost has already announced an updated version with improved characteristics and a greater degree of localization. This should end the company’s dependence on components imported from Israel and enable it to increase output. Additionally, the MoD is currently selecting new models to plug the gap between the Forpost, which has a take-off weight of 450kg, and the 18-30kg tactical drones.